From pounds to tons per day, 1st Choice Leasing can fulfill your needs for ice through our comprehensive refrigeration leasing program. Icemakers of all sizes, reach-in refrigerators and freezers, countertop and hotel ice dispensers are all a part of what we can provide with our full maintenance closed end lease program. For one simple monthly payment we will deliver, install and service the equipment you need. We clean and maintain the equipment on a regular basis at no added cost. If your machine breaks down----we respond quickly to get you back in business. Please call us today at 210 225-3033 to get started. We will be happy to send one of our professional associates to access your needs. If you prefer, fill out our on-line inquiry form and we will contact you immediately. For more than thirty-six years, 1st Choice has been leasing and servicing ice makers and refrigerators in south central Texas. 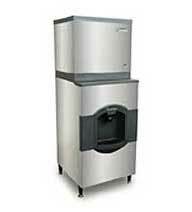 Remember, we want to be your 1st Choice for ice machines!